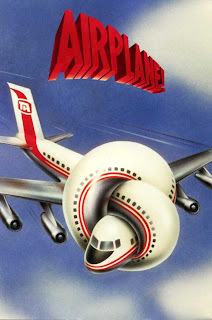 This summer marks major anniversaries for a Blockbuster full of classic movies ("Back to the Future" just turned 25, belive it or not), but surely few hold up as well as "Airplane," which celebrates its 30th anniversary this summer. It's true -- and don't call me Shirley. Barbara Billingsley stepping in to help: "Oh, Stewardess, I speak jive." Captain Oveur and Roger Murdock doing a "Who's on First?" routine: "We have clearance, Clarance." "Roger, Roger. What's our vector, Victor?" Just about anything Leslie Nielsen says: "It's a big building with patients, but that's not important right now." Definitely anything Stephen Stucker (Johnny) says: "This? Why, I can make a hat or a brooch or a pterodactyl..."
We could keep going, but the Internet might run out. For a more in-depth trip down memory lane, check out the Huffington Post's recent tribute to this classic flick. What's your favorite "Airplane" memory? "Have you ever been in a Turkish Prison? Peter Graves was great in that movie. Maybe a better straight man than Leslie Nielson was in that movie.